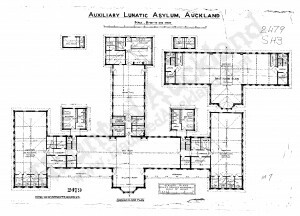 Whau Lunatic Asylum (or: Lunatic Asylum at the Whau; later: Auckland Lunatic Asylum, Avondale Lunatic Asylum, Avondale Hospital, Auckland Mental Health Hospital, Oakley Hospital; Carrington Psychiatric Hospital; commonly Carrington/Oakley Hospital) was a psychiatric hospital on the Oakley Farm Estate situated in Point Chevalier, Auckland. 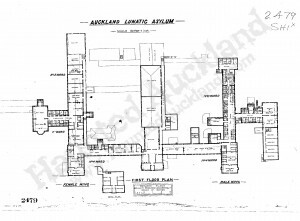 Built in 1865 on the Great North Road, it was one of the largest asylums in the Colony. “Whau” is the common name for Entelea, a species of tree endemic to New Zealand; the Whau River is located within the Auckland metropolitan area. Financial backing to build the hospital came from the provincial government. In September 1863, architectural plans by a Mr. Barrett from England were submitted to the Auckland architect James Wrigley who adapted them. Henry White was the builder. John Thomas of Oakley Creek was awarded a brick contract for the building materials, but being unable to complete the contract, it fell on Dr. Pollen to supply the rest of the bricks. 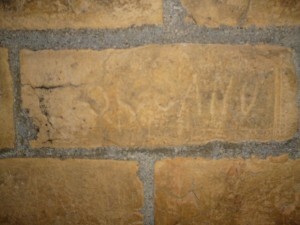 Some of the bricks were produced on-site while others were produced at Dr Pollen’s Avondale brickyard. After the building was gutted by an 1877 fire, Philip Herapath supervised the reconstruction. From 1869 to 1879, Dr. Thomas Aickin served as medical superintendent. In 1891, Dr. T. R. King, Medical Superintendent, resigned because of ill-health, and was succeeded by Dr. Gray Hassell, who had been an administrator at the Wellington Hospital and Wellington Asylum. In December, 1900, there were 494 patients—306 males and 188 females. The staff included 31 males and 21 females. The average net cost per patient was, in 1898, £19 13s, and, in 1899, £20 8s. The average number of patients sent out cured in 1898 was 51%, and in 1899, 38%; average deaths, 1898, 7.5; in 1899, 8.8. 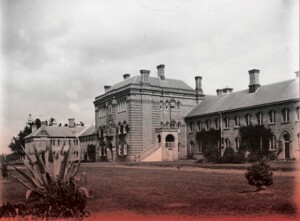 The officials of the institution at the time were Dr. Robert Martin Beattie, medical superintendent; Dr. William Webster, assistant medical officer; Edward Newport, head attendant; Sophia Campbell, matron; and J. D. Muir, farm manager. Religious service was held on Sunday by ministers of the denominations of which patients are members. 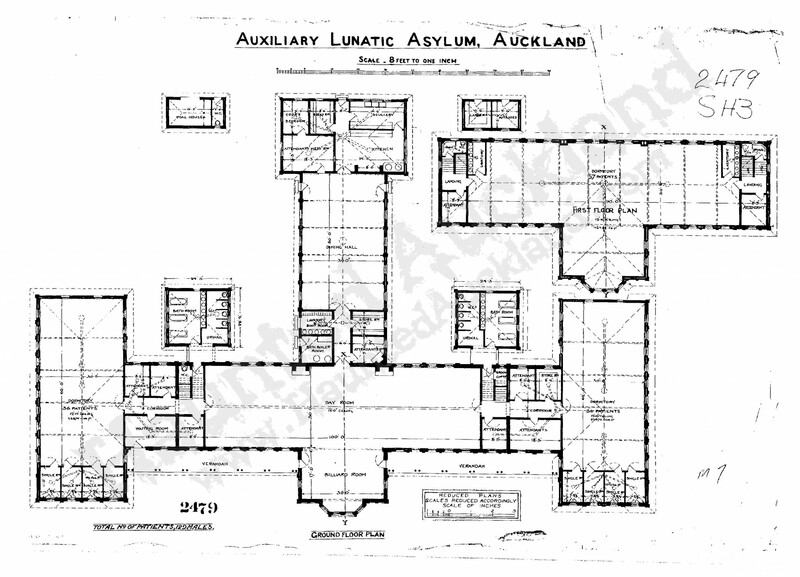 The asylum underwent several name changes. 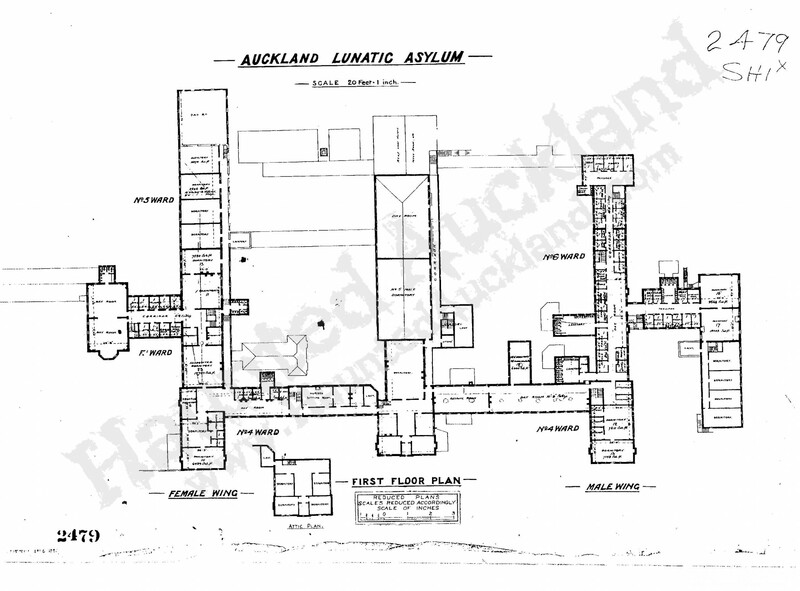 It was known as Auckland Mental Health Hospital in 1959. In the 1960s, the work week averaged 60 hours and staff had only one day off each week. 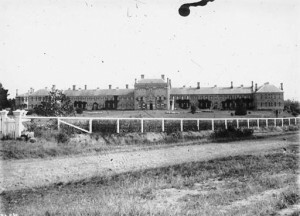 Avondale Mental Asylum became Oakley Hospital, a male forensic unit. The institute’s centenary was celebrated in Oakley Hospital in 1966. The Auckland Psychiatric Hospital was officially renamed Oakley Hospital in 1962. After merging with Carrington Hospital, the hospital had 600 beds. In 1964, Dr. G.M. Tothill retired as medical superintendent and Dr P.P.E. Savage was appointed to take his place. 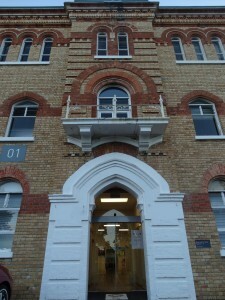 In 1971, the building was considered to be one of the best Victorial buildings in Auckland. 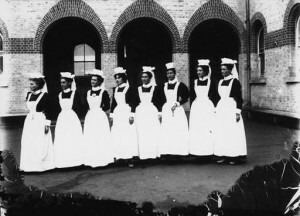 The Auckland Hospital Board took control of the hospital the following year. 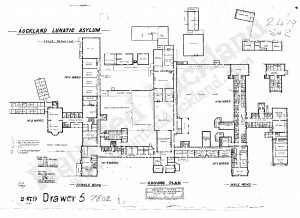 Controversial plans were considered for the hospital’s M3 Ward to be turned into a medical security prison in 1986. 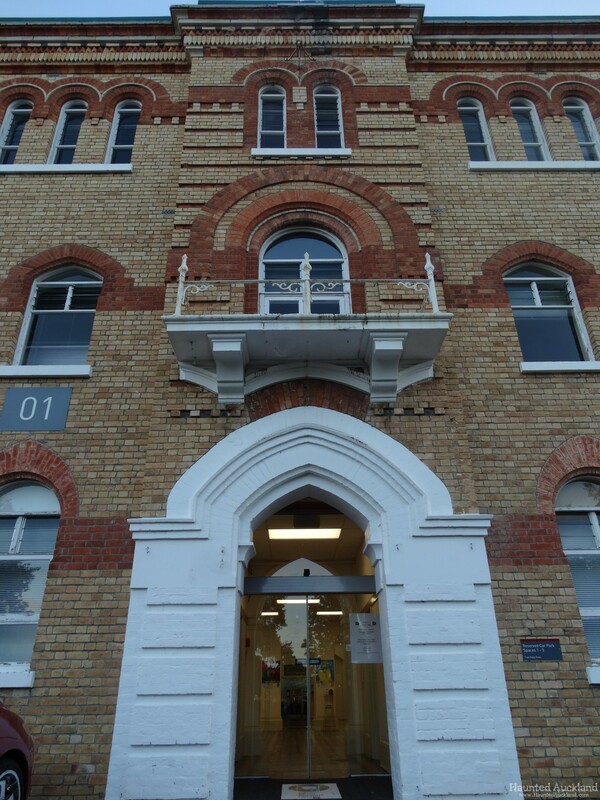 In 1992, Carrington Hospital was closed by the Auckland Area Health Board and was purchased by a tertiary education provider, Carrington Polytec, who refurbished the building, opening the Unitec Institute of Technology School of Architecture and Design in 1994. 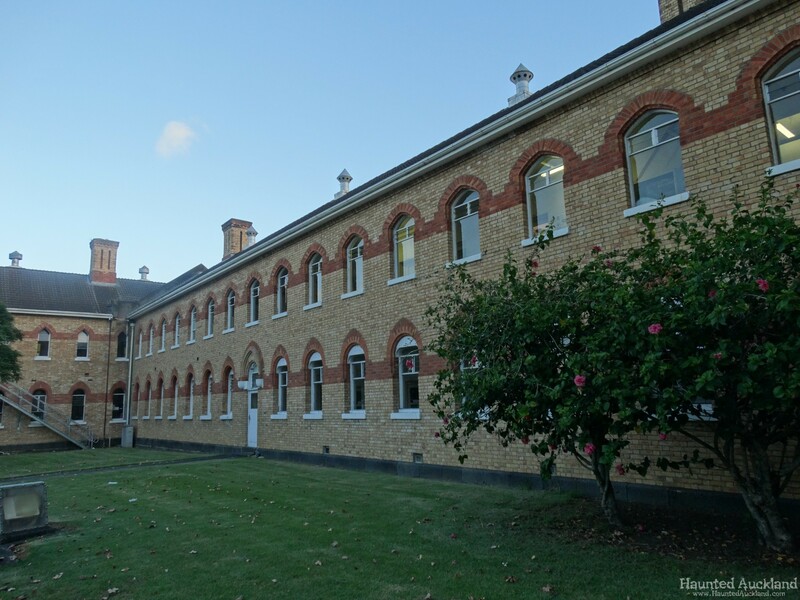 The original building is now used by Unitec’s departments of Architecture, Landscape Architecture, and Design and Contemporary Arts. 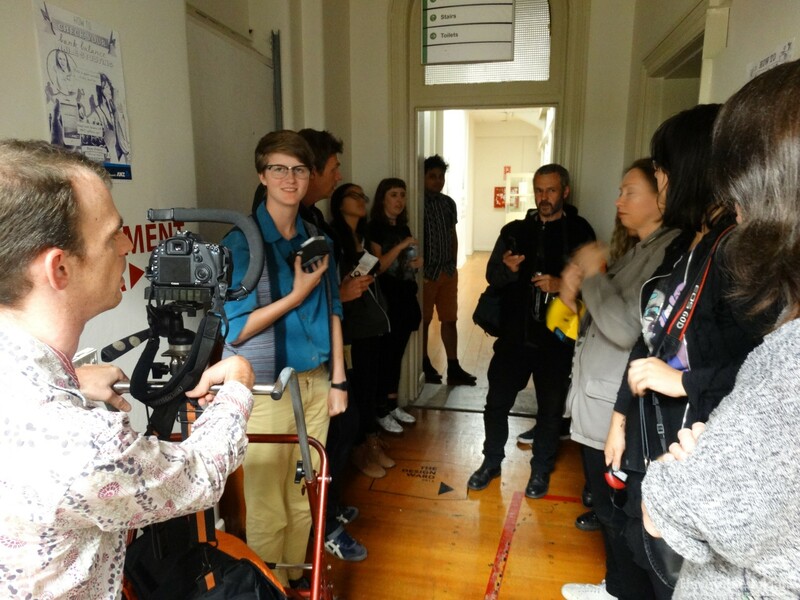 Specialising in hands-on, more creative courses like Graphic Design, Filmmaking and Building, Unitec offers fantastic tertiary programmes that are now recognised and valued overseas. The facade is neoclassical and has polychromatic detailing. 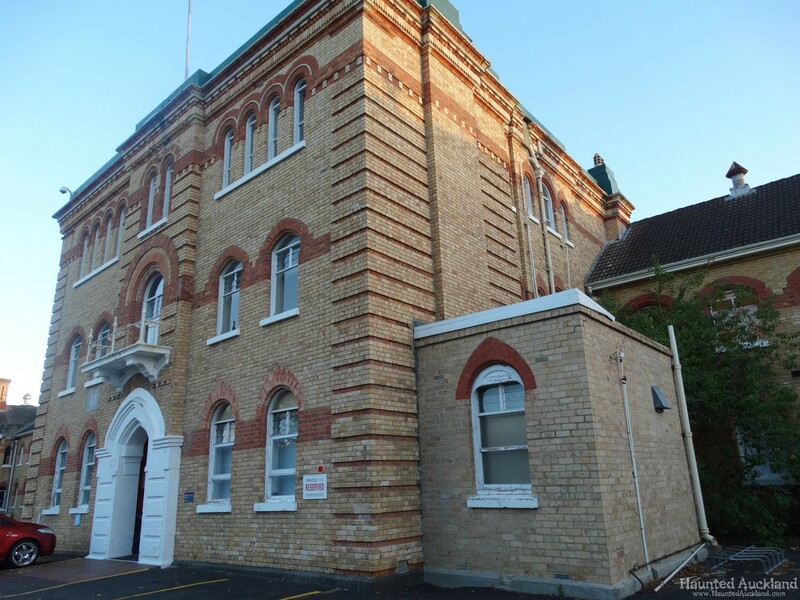 Built of brick, it faced the junction of Great North Road and Carrington Road, leading to Mount Albert. In the central portion of the building were the dining halls, kitchen, and store-rooms, and the two adjoining wings were the male and female wards. The male dining hall was also used for theatrical and musical performances. Auxiliary wood buildings were destroyed by fire in December 1894. A new brick building was completed in 1896–1897. The chapel of St Luke the Physician, built in 1865, was used as a dormitory since 1875, but was renovated and reopened as a chapel in 1961. The Conolly Room at the hospital was named after English doctor, Dr. John Conolly. A spring on the estate, with a waterfall on Oakley Creek, was ample for domestic and fire prevention purposes. A farm, consisting of nearly 200 acres (81 ha), was attached to the asylum, providing for healthful recreation and fresh vegetables. There were approximately 50 milk cows on the estate, and a large number of pigs. An unlimited supply of fresh eggs, were obtained from the farm’s poultry. Part of the land was turned into an experimental sewage farm. The oldest building has several notable trees and shrubs of interest including holm oak, sweetgum, chaste tree, and pigeonberry, now part of the Unitec Arboretum. In 1969, the Auckland University Council decided that the farm was not suitable for university development, but wanted to convert 50 acres (20 ha) for playing fields while Auckland Technical Institute wanted 20 acres (8.1 ha). In the late 1800s committed patients averaged 900 in number, with an estimated average of eight deaths a year. 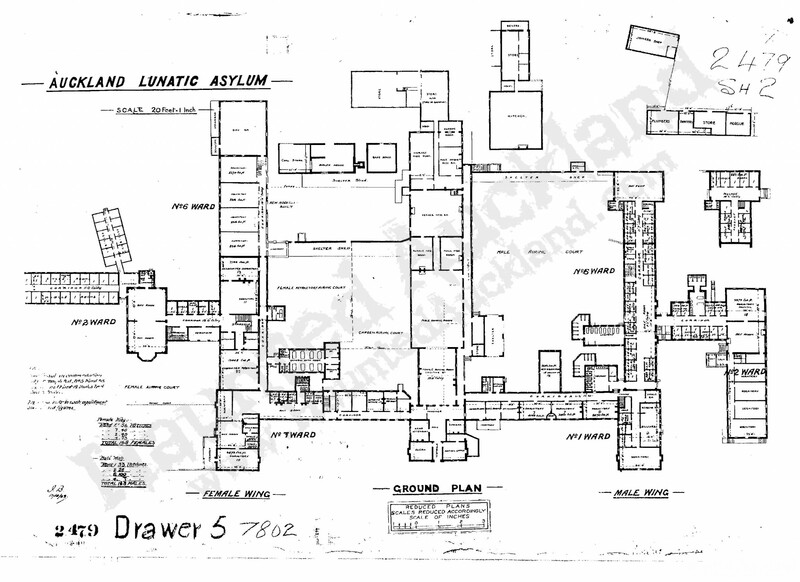 The Asylum was gutted by fire twice. 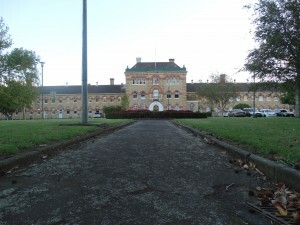 On 20 September 1877, the first of two major fires occurred at the Lunatic Asylum that century. The first, and worst, was set by a patient and resulted in one female “inmate” being burned to death. The charred remains of a patient, were recovered amongst the ashes of the dilapidated building. 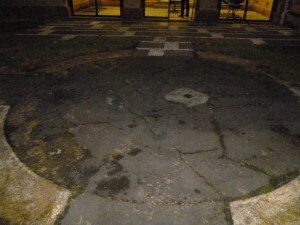 The woman responsible gave evidence to police and reporters about her role in lighting it. It was believed that Mrs Fortune had instigated the fire after gaining access to a box of matches, during a visit from friends earlier that afternoon. Names, day counts and pictures etched into the exterior brickwork by the patients. The spread of the fire remained mysterious, reports show officials could find nothing to indicate why the abundant water supply from Oakley Creek had failed on the night of the fire. Accusations were made that the City Council had turned the water off. Over the years there have been sightings of a woman in Building one. Could this possibly the patient who was burned alive? 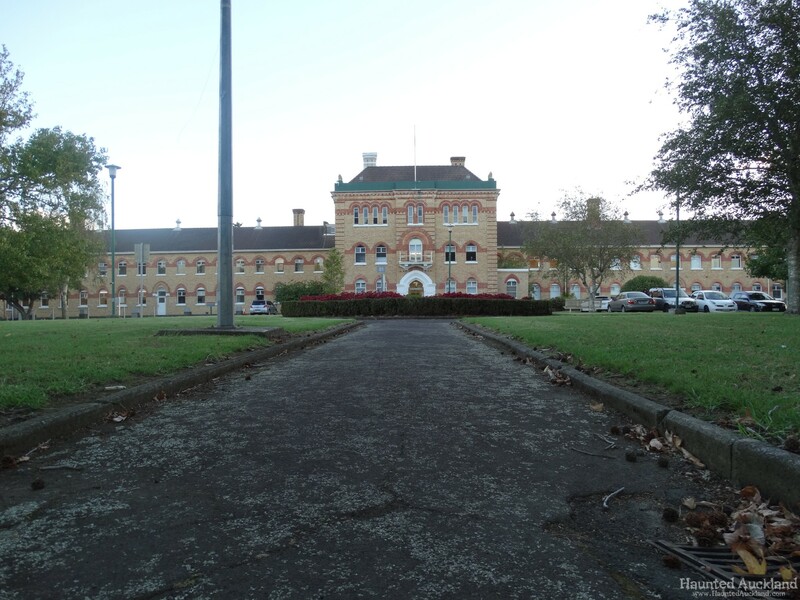 Additional deaths ensued among both patients and staff in the subsequent years and it is estimated that hundreds of people died on the site during its 130 years of operation as a mental institute. In 1922 alone 60 patients are believed to have fatally contracted typhoid. These deaths were allegedly not made public because they related to the poor sanitation at the hospital, due to the use of dirty water wells. Other peculiar deaths include the pitch forking of a warden, by an inmate, killing the guard instantly. Another was the blundered suicide of Thomas Meredith, found more than two weeks after he had slipped away from the premises, hanging by his own belt, from a tree near the asylum and the suicide of Thomas Lynch. In more recent times, the 1982 death of Michael Watene, following the administration of electro-convulsive treatment. 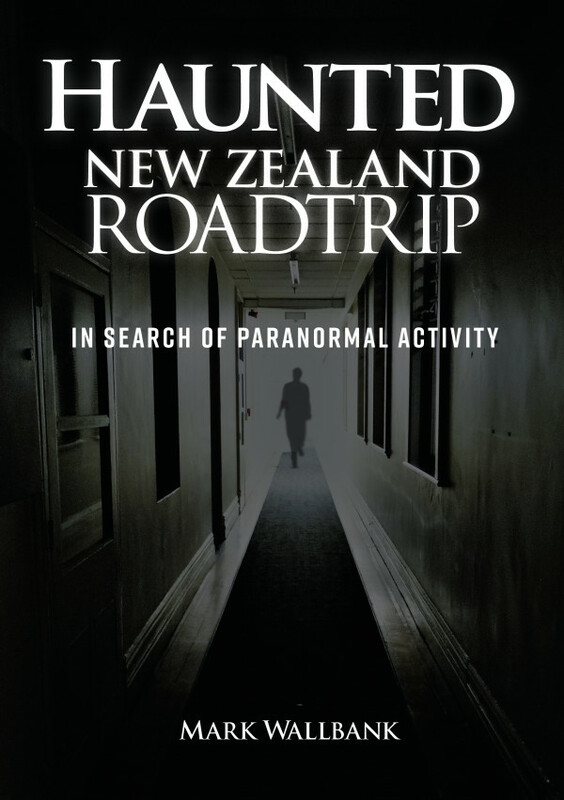 When asked, Unitec Security put the ghost rumours down to folklore, urban legends passed down from one student to another. They say eerie noises are a result of air entering joints of old windows, and creaking and banging is caused by the old iron heating systems. They say there is a logical explanation for every peculiar noise. However, they understand it is common for people to believe that, because it was an institute that incarcerated people, the spirituality of some patient’s remains. 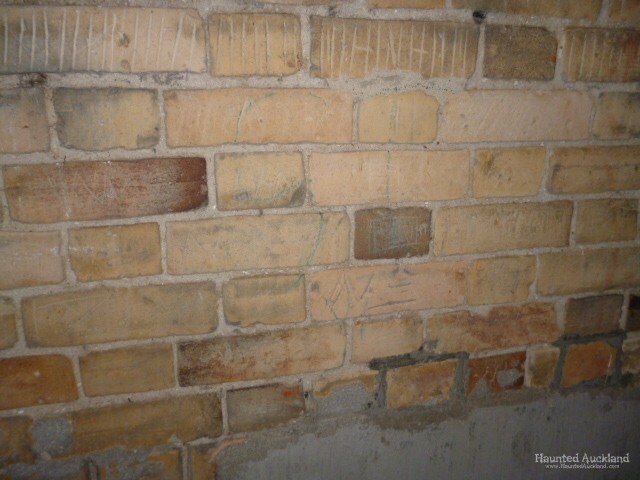 Through the years there have been many reports of unusual activity within Building 1. – Shadows seen moving around rooms and down hallways. 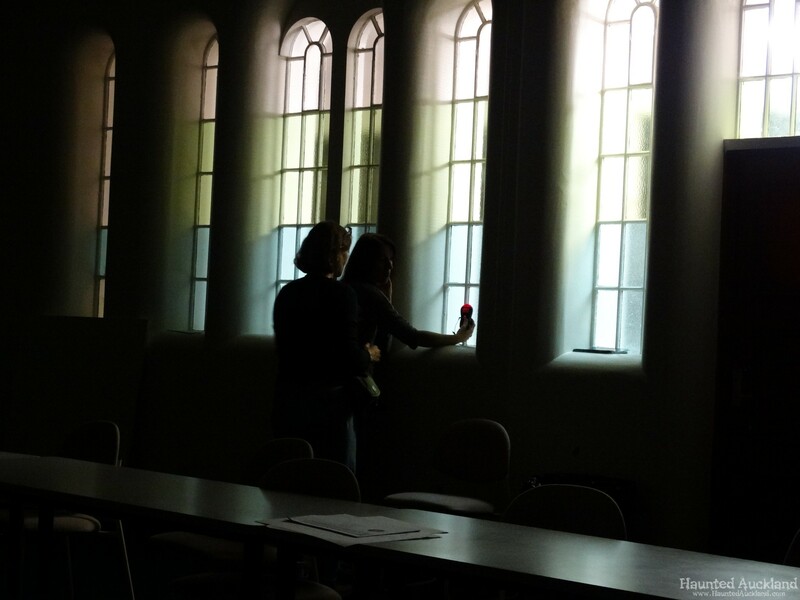 – Glimpses of ‘people’ through the glass portion of the locked door. 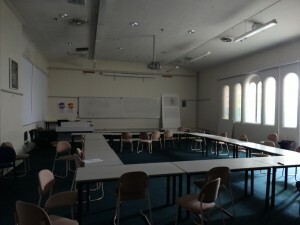 On entering the room is empty. – Voices heard when no one is around. – The sound of keys clanging. – A large paintbrush was thrown across a room. – A mug flew across the room and break in the old chapel. – Books thrown off shelves. – An apparition of a ghostly woman wearing a black and white nurse’s uniform. – Students and tutors being ‘pushed’ on stairs. – Sensations of being slapped. – A woman has been heard screaming in one of the bathrooms in the west wing. – Doors heard or seen slamming by themselves. 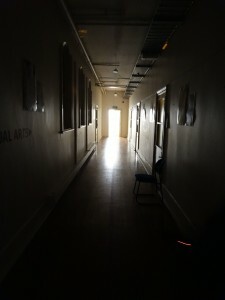 – Many stories of footsteps heard down corridors. – Various items seen moving or falling without reason. – Radios changing stations on their own. – Feelings of being watched. – Feeling of nausea, headaches and unease in certain areas. – Lights switching on and off. – Machines turning on by themselves. – Curtains moving with no windows open. 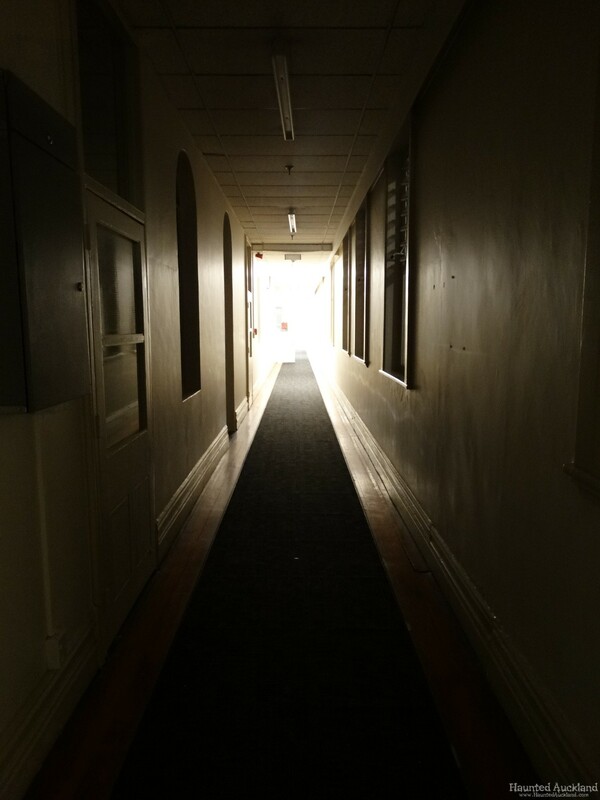 We put the call out on the Haunted Auckland Facebook page for those that had experienced unusual activity with the Carrington buildings, to write in with their stories. 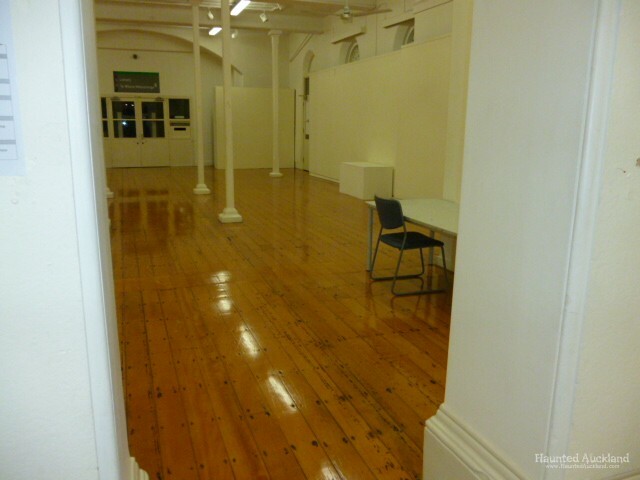 Haunted Auckland has so far conducted three investigations of this location. Note – The data and gathered information from the three sessions has been compiled and condensed into this one report. Weather conditions on all three nights: Fine and cool. Clear sky. 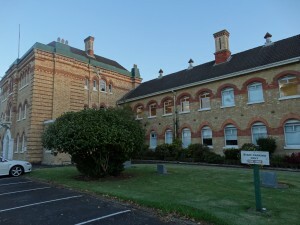 The building is a huge old brick psychiatric hospital. It has three wings, is two storied and has a labyrinth of tunnels running under it. The interior of the building bears little resemblance to the original hospital as it is now is a tertiary institution with classrooms, artist’s studios, computer labs, cafeterias, lecture theatres, libraries, conference rooms etc all linked by a maze of corridors and ancient stairwells. The tunnels under the building have not been renovated so remain in a similar state to original. Some can still be seen around the outside of the building as they have metal grates over them. Activity has been ongoing for many years. So much so that the Uni gets ‘blessings’ and Tapu liftings on a somewhat regular basis. Many of the students spoken to, can tell a story about some odd activity that has happened to them or someone they know there. 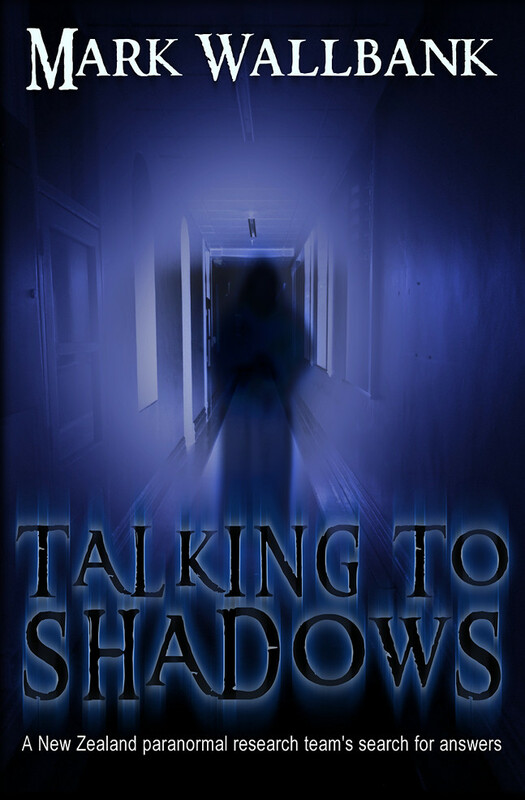 Most of the apparent paranormal activity we have heard about ranged from touchings and pushings, to fleeting shadows and witnessed moving objects. Through the generations there were many deaths within the location. Natural, suicides, accidents, fires and murders. Though locating definitive information about these has proven difficult so far, so at present we are relying on anecdotal evidence with perhaps a few years of chinese whispers and urban legend. There are many stories, but how many are based on fact? Barbara – A very impressive yet imposing brick building. I can imagine the terror of anyone who was being brought here as a patient when the building was a hospital. It never ceases to amaze me how the building can look so imposing on the outside but so school-ish on the inside. 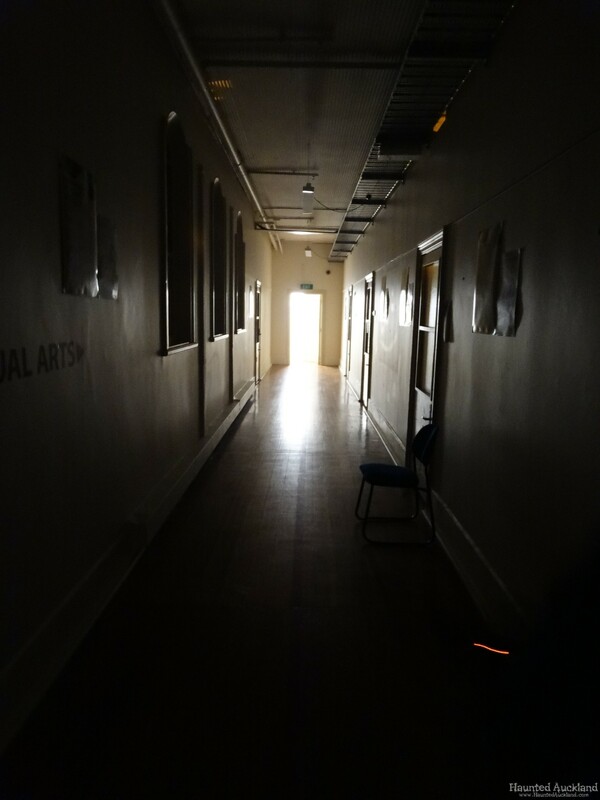 I know (from a previous investigation) that there was ‘something’ (a black shadow), that lurks in the entranceway, close to the pillars in front of the room before the library, so I am immediately into ‘paranormal investigator’ mode upon entering the building! I met Mark and our host in the entrance of the No. 1 building. We were shown around all areas of the interior two stories of Building 1 as well as areas of interest on the outside. Pointed out were the locations he had seen or experienced paranormal activity which sometimes coincided with experiences I had had (or had heard others had had) in the building. Mark – The building is huge and covers a lot of land. To get to the main entrance, a drive around the back way is required. A slow, speed-hump laid, cruise around its perimeter really starts to show you the immensity of this building. It is as impressive inside as it is outside.a figure walking past a nearby window. For the second session, an investigation of the mighty Building 1, James and Mark lead a small team of 6 photographic tutors and students each. An enthusiastic group of photographic students, interested in delving deep into the world of the paranormal, getting familiar with techniques and equipment and seeing firsthand how different things can be when reality is held up against the stigma of U.S TV shows. 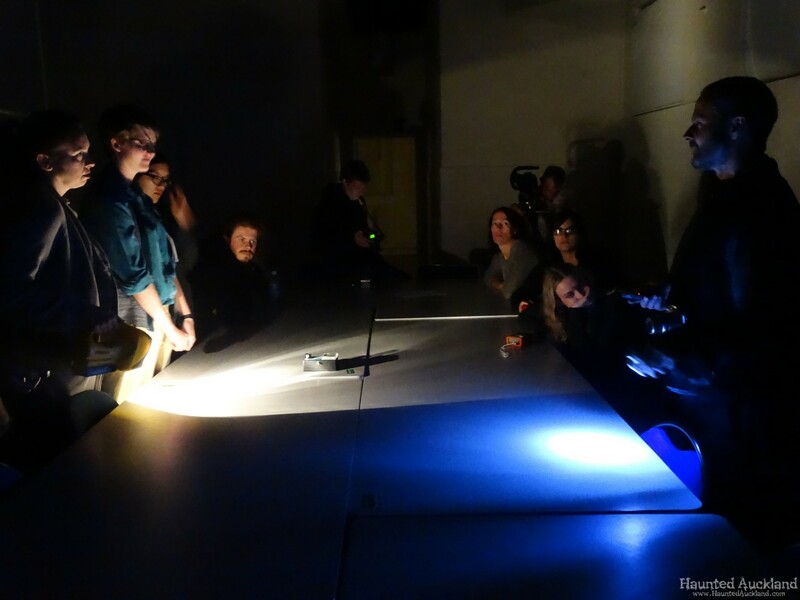 James Gilberd did a guest lecture for the photography students in the morning, and with tutors Yvonne Todd and Marie Shannon, we were invited to conduct an investigation of the design school area in the evening. We did not go in the Architecture area (SE half of Building 1) or the Library (centre of bldg). Present: Mark Wallbank (Haunted Auckland) Yvonne Todd & Marie Shannon (Unitec tutors), James Gilberd (Strange Occurrences, Wellington) and students: Isobel, Jamie, Lauren, Rachael, Yvonne, Mark, Garrett, Cass, Wei May, Wayne. – Weather was mild. Inside temperatures in the low 20s C.
Surface temperatures within the building stated pretty stable through the night, ranging from 21.5 to 22.3 degrees. We synchronized our Audio recorders at 7.45pm. In James’ team, one was retained by James, the other by Marie. In Mark’s team, Mark held an audio recorder. Both teams utilised 3 EMF Meters, audio recorders, cameras and a thermometer during their sessions. James – After an initial walk round from the NW side of the building to the central area (we didn’t look at the SE end of the bldg) with the entire group, we arrived at the café and split into two groups, one led by myself, the other by Mark. 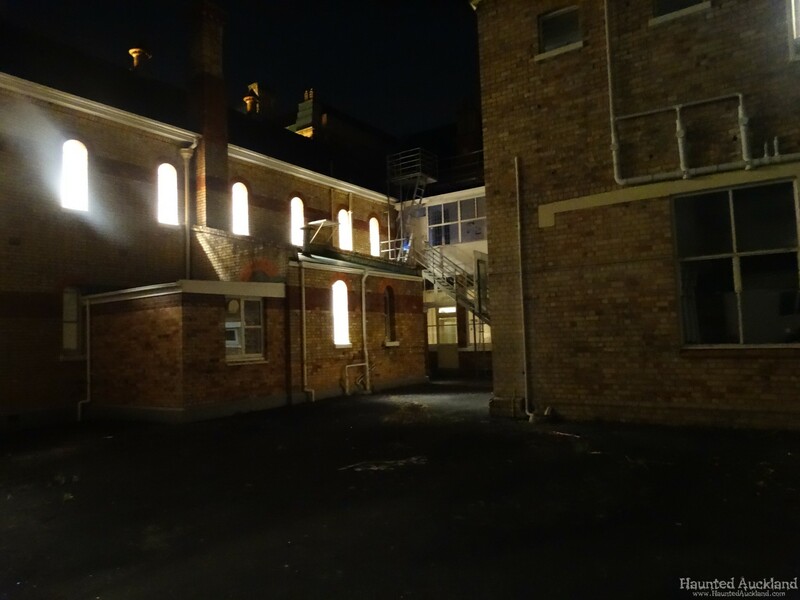 During the second investigation, the main activity we experienced during the night, were unusually high EMF levels. 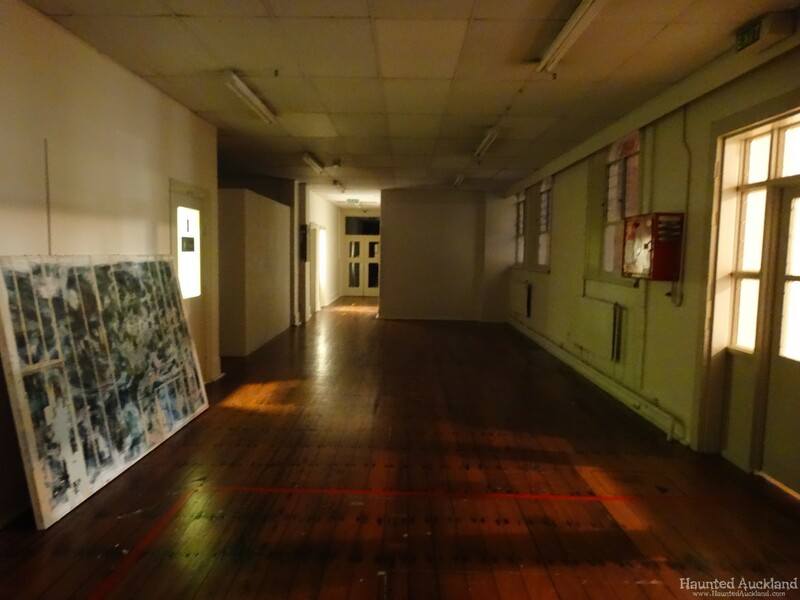 The teams were picking up unusual Electromagnetic field readings in various places throughout the building. What made these even more interesting, was that they seemed to move. Appearing in one spot, then, within seconds moving a few feet away. Whether this was in fact natural occurrence or typical building energy field, we were unsure, however, surely if the energy emissions we were documenting were fields caused by wiring, internal electrics etc…surely they would be stable and static and not ‘move around’? The size of the fields were interesting also, most we detected measuring only a few feet in circumference. Please note that we are not stating that we had been experiencing paranormal activity during the sessions. Only that we were picking up many interesting energy field levels that didn’t make sense to the team at the time. Also, to be noted was that 2 different models of EMF meter were used this night, so we were able to compare and reading to further confirm whether or not the activity was caused by something happening internally within the meter. 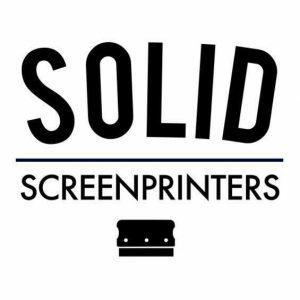 Faults or glitches etc. 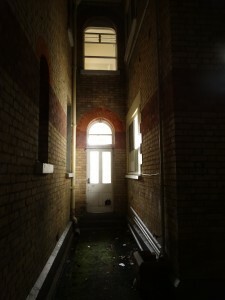 – Off the scale readings (beyond 5 Mg) were documented in a hallway leading out into a court yard on the North West wing. Outside room 1167. – We picked up numerous odd EMF fluctuations throughout the night. Mainly in hallways, but not along wall lines or down low, with would present the possibility of internal wiring. The fields seemed to be ‘floating’ down the hallways. Always at about chest or head height. – Outside room 001- 1094, along the Contemporary craft design product and furniture design hallway. 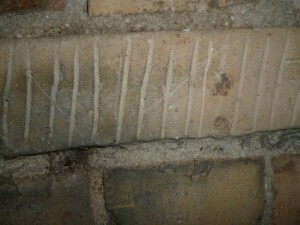 A heavy field was measured along a section of the hallway wall, at very unhealthy levels. We deducted this was due to steel plating and air venting fitted into the wall. – A couple of the rooms were locked but gave off Low EMF readings showing that there was electronic equipment inside. On asking we were told that these rooms did in fact house many larger pieces like photocopiers and around 4 or 5 computers. Still the level of EMF seemed an unhealthy high in these circumstances with the EMF meter jumping over the 5 mg mark. Even when held a foot away from the door. – ‘Toilet’ studio. (jokingly called that because the sound of the next door toilet flushing can clearly be heard during lessons) We picked up a brief EMF jump. From 0-5 Mg suddenly, at chest height, then after about 5 seconds, nothing in the area at all. – In the café / lunchroom we found that there was a strong electrical field within 4 support poles in the middle of the room. 2 of the poles showed unusually high 5 Mg levels, whilst the other two didn’t. However when walking into the centre of the surrounding poles, the field was off the scale. We thought that perhaps there was wiring within 2 of the poles causing this as they sounded hollow, but are unsure. The kitchen equipment levels were tested with only the fridges registered on the EMF meter, which is quite typical. Highest reading in the kitchen was a Red Bull fridge at 3 Mg.
– At one point when both teams had converged in a corridor, all four EMF meters were triggered at the same time, creating a bizarre momentary orchestra of meters, all beeping in electronic, almost harmonic unison. – In the chapel we spent quite a bit of time tracking mysterious energy ‘balls’ around the room. The fields seemed to be constantly moving. Never remaining static in one area. The Sound system amp gave off a 1.5 to 2Mg Reading, which was understandable. At one point we seemed to be able to get one to move from one EMF meter to another, a few metres away. We had asked whatever we might have been experiencing to move from meter to meter, which appeared to happen. Coincidence? We were unsure, but enjoyed the experience. One of the stained glass windows in the Chapel room also gave off a strong reading, though we could find any wiring or possible sources for such high fluctuations. 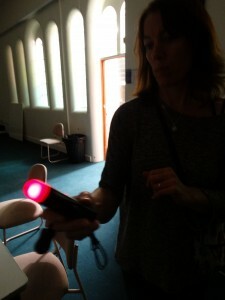 The second team also reported some ‘subtle responses’ via EMF meter, to their questions, whilst they were in the Chapel. – [Mark] – In Print studio One, I experienced sudden battery drain on my camera. New batteries were inserted at the beginning of investigation. A battery draining occurred twice during our session. – 8PM, outside Rm 1165, the Trifield meter carried by Garrett registered a magnetic field up to 3 milligauss in the middle of the corridor, while held at about head-height. – We were unable to relate this reading to any of the electrical wiring in the vicinity. – Other, similar readings were noted at various points along the corridor, NW wing (outside Rm 1167 and in other places). – Rm 1094, (corridor outside) Cell Sensor EM meter and other meters reading up to 3 milligauss mid-corridor. At 8.30pm we all met in the café on the ground floor, then re-synchronised the recorders. The two groups remained the same and we swapped floors. We explored for an hour, doing EVP sessions in various rooms. We met up again at 9.30pm and again re-started the recorders. Some of the students left at this point. A group of us (James, Yvonne Todd, Garrett, Cass, Yvonne) went to explore the darkrooms. 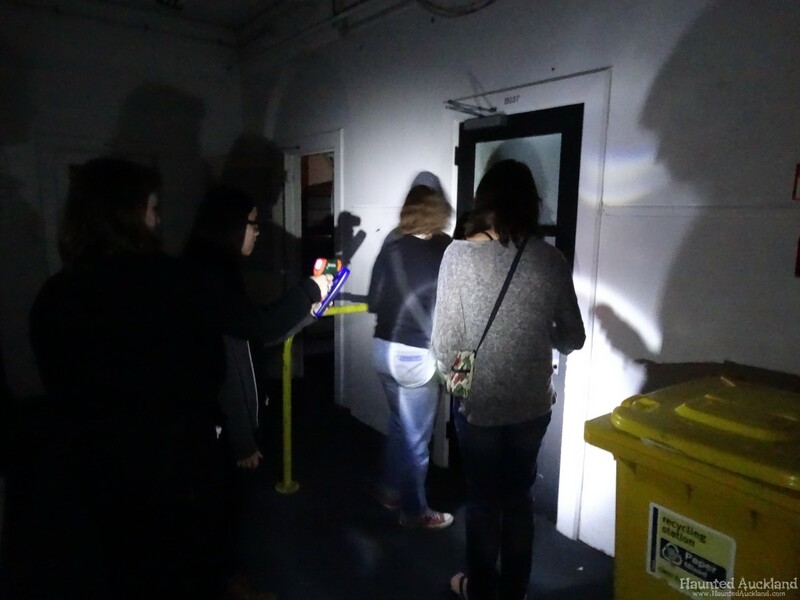 – Darkrooms under SW wing: we had a 3-minute period of the natural EM meter and the other two EMF meters reacting strongly. The Natural EM meter was placed on the ground by the big rail enlarger in one of the inner darkrooms. I was showing how it would react to vibration and movement by tapping my foot next to it. This seemed to set something off and there was intense, fluctuating readings for several minutes. – After this we conducted an EVP session, with little apparent reaction (although the Natural EM meter was heard to react at a low level following some of the questions). – Some people upstairs could be heard very faintly in the background of the EVP recording, in places. – I don’t have a time check on the start of the recording, but the incident occurred at about 10pm. I have no idea what would make the Natural EM meter react this strongly for this length of time. It would require a moving magnetic field of some kind. The rail enlarger was turned off and utterly stationary. The EMF meters were reacting as well. After the three minutes the reactions lessened significantly. – The darkrooms are in a basement area and are quite claustrophobic-feeling. You have to go through several rooms to get to the internal one in which we had the EM reaction. The investigation concluded at 10.30pm. 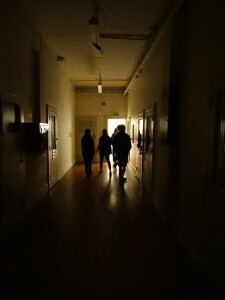 – On entering a small storage room at the end of a long hallway, 2 or the team reacted to an ice cold blast of ‘wind’ swishing past their necks. – A loud ‘bang’ was heard down one of the corridors. Possibly a door slamming with force. – A few team members reported feeling ‘drained’ at times. Session 3 yeilding very minimal results this time. Only a few subtle EMF fluctuations, (light and brief flickers from 0 – 2 mg) but nothing I would get excited about. 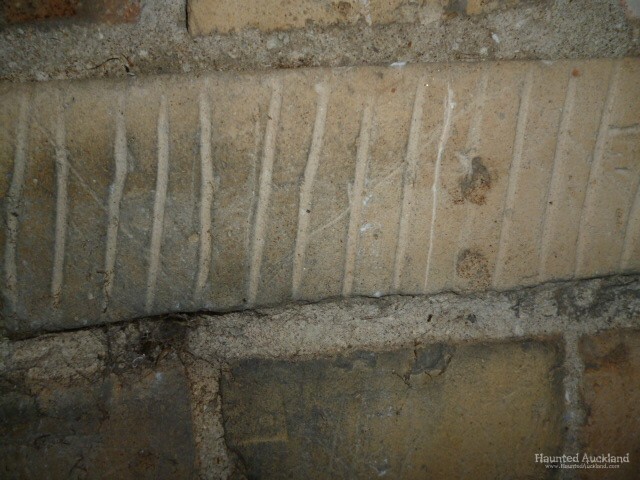 Slightly longer EMF occurrence (1 minute) whilst visiting the Chapel once again. Mark – As it did at the previous investigation, the energy field seemed small in shape / size. It again appeared, then disappeared. I was unable to track any movement this time as it didn’t hang around long enough. 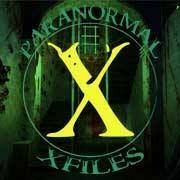 2 x 10 minute EVP communication attempts with no anomalies on audio review. A few attempts were made to capture Electronic Voice Phenomenon, but proved unsuccessful on completion of audio analysis. No audio anomalies were found on any of the recordings from our sessions. Barbara – I saw nothing during this visit to make me think the building is haunted but from the stories I have heard and from prior experience I believe it would be beneficial for the group to do a full investigation of this building. 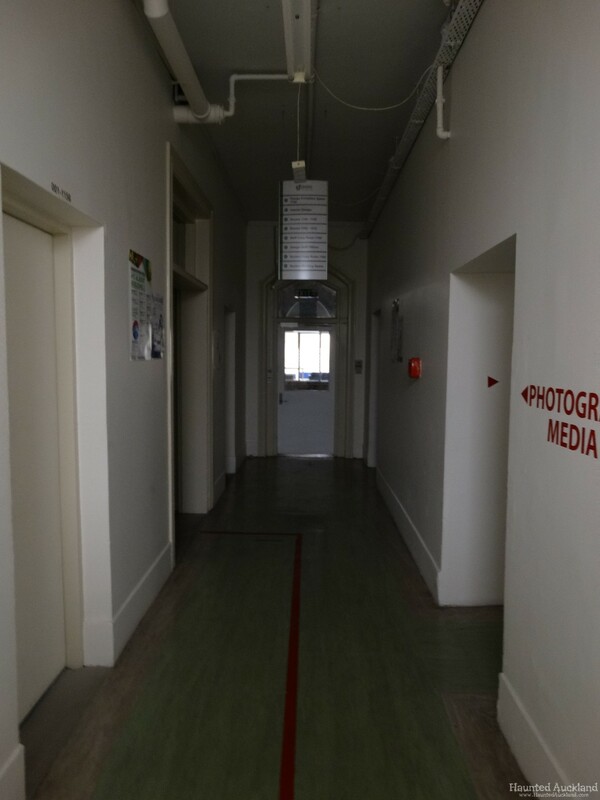 Our host pointed out the locations he himself had seen or experienced paranormal activity in the past, which interestingly enough coincided with the experiences I had had (or had heard others had had) in the building. 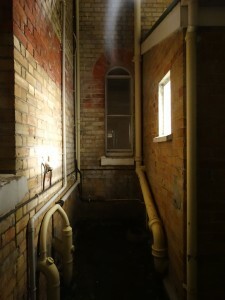 I saw nothing during this visit to make me think the building is haunted but from the stories I have heard and from prior experience I believe it would be beneficial for the group to do more full investigations of this building. Mark – During the 2 sessions I was present at, I found the most activity happening during the second, group / 2 team investigation. Mostly EMF responses, but odd because they didn’t seem to be reacting to any wiring or electrical equipment we could see. The fields we picked up on that we could not find sources to, were mostly down the centre of hallways and in the chapel room. Almost all were at around chest to head height. The EMF fields we were experiencing seemed to move from one spot to another. Never static and stable. 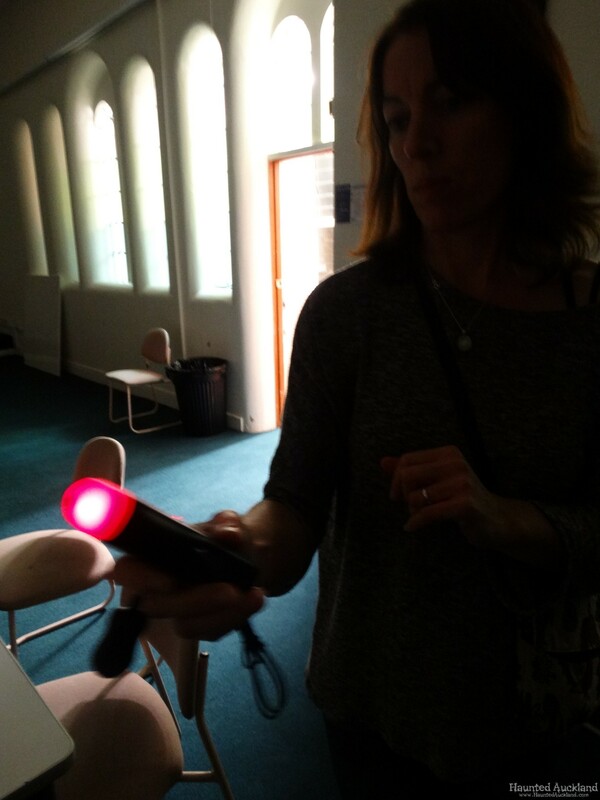 We spent some time ‘tracking’ anomalice energy field around rooms. It was definitely interesting to say the least! Do I think that Unitec is haunted? At this point I don’t know what is going on there, to be honest. I can’t disregard all the stories and claims that have been forthcoming through the many years. People are seeing, feeling and experiencing something in this place. The high EMF levels might explain away some of the feelings of paranoia, sickness, dizziness etc. If people are feeling dizzy, then that might cause them to stumble on stairs and as if being pushed….maybe. But, to come to a solid conclusion such as this, first we need to find the sources of the EM fields. Something we found rather difficult to achieve in our sessions there so far. 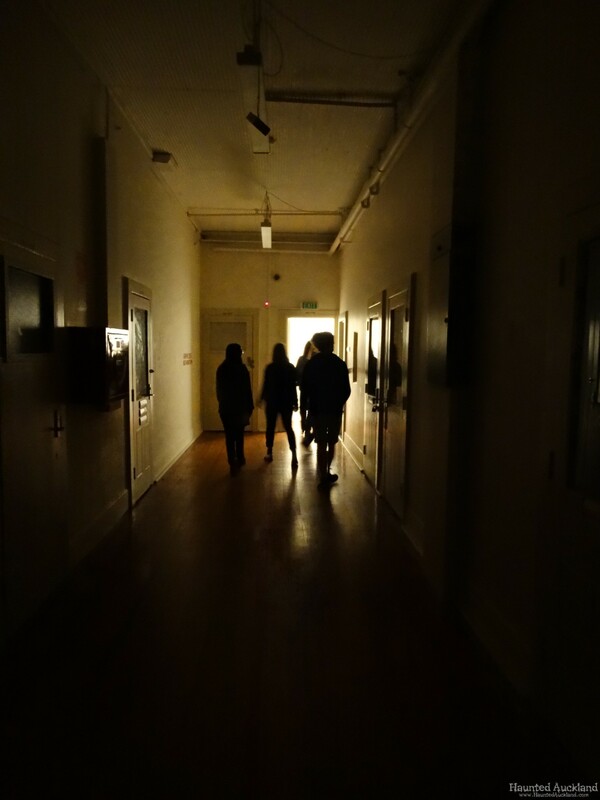 More research and investigation will need to be done to gather more data, before coming to any serious conclusions as to the buildings haunted status. A big ‘Thank you’ to James Gilberd for inviting me on his investigation session. My mother spent years n and out of this place. Drugged up like a zombie:( I remember visiting her as a kid. I remember the strange feeling I got here. I remember sitting in a large waiting area, there were games and books? And patients walked up n down the corridors staring in at me. I remember my mothers room and looking out her window. Even that young… I did not like the feeling of the place. Sti makes me feel sad and uneasy whenever I pass the complex. I worked at Carrington for 15yrs, had some interesting events especially when on night duty. The place is haunted in all 4 buildings I.e. main building, old WD15,16,17, male 7 and male 3 and especially where chapel is. I worked at Oakley in early 70s and frequently did night duty there. It wasn’t a place to spend the night I can tell you. I heard footsteps where there was no one and yes doors opening and shutting.